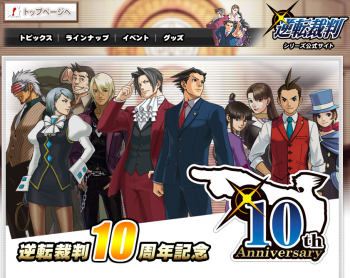 Today, Capcom is commemorating the 10th anniversary of the Ace Attorney series - except the evidence doesn't hold up under cross-examination. --wait, what? You're telling me that the first Gyakuten Saiban game came out for the GBA on October 12th, 2001? Which would make this the ninth anniversary of the game, and not the tenth? Ooh, that's kind of awkward. To give Capcom some credit, though, it seems that the publisher is well aware that this is actually the series' ninth anniversary. In an interview with series creator Shu Takumi, Takumi jokingly acknowledged that the decade anniversary was still a year away - but said that development in the game had already been under way ten years ago. Takumi said he'd started working on the first design document, originally just titled "Lawyer Game," in August 2000 after finishing work on Dino Crisis 2. Andriasang also notes that one of the links on the Gyakuten Saiban site features a mystery image labeled "??? x ???." Given that the book in the image is apparently titled Majo Saiban ("Witch Court"), some fans are speculating that this could lead to a collaboration project with the 2009 Japanese TV drama of the same name. Whatever is in store for our blue-coated lawyer hero, we can still go ahead and wish Phoenix Wright a happy 10th birthday. Even if it is his 9th.